Bon Jovi is an American hard rock band from New Jersey. The group is fronted by lead singer Jon Bon Jovi and was founded in 1983. They are one of the world's most successful rock bands in the 1980s, 1990s and 2000s with over 120 million sold albums. The 1982 written and recorded song "Runaway" by Jon Bon Jovi reached the first place in a radio talent contest in 1983. So he became the possibility to sign a recording contract. Consequently, he founded Bon Jovi in 1983 with Richie Sambora, David Bryan, Alec John Such and Tico Torres. The self-titled debut album "Bon Jovi" was released in 1984. The single "Runaway" was the band's first hit and reached #39 on the Billboard Hot 100 in 1984. Bon Jovi's second album 7800° Fahrenheit had only moderate success. In fact, every member of the band had lost their girlfriend at the time, they were all heartbroken; those feelings were showing in the songs. 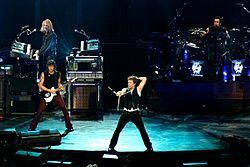 Some members, especially Richie, were afraid because they had not put out a single hit since "Runaway". The band then went to Vancouver to record another album. They lived together while they were recording. In 1986 the third album Slippery When Wet was released. It brought some of the band's most successful songs, including "Livin' On A Prayer", "You Give Love A Bad Name" and "Wanted Dead Or Alive". Significantly involved in this success was Desmond Child, who co-wrote many of the songs. "Slippery When Wet" has sold over 26 million copies since its release in late 1986. The Slippery When Wet Tour let the band become even more famous in Europe and North America. The song "Livin' On A Prayer" is the one that had the most success. In the beginning, Jon did not like the song. He refused to put it in Slippery When Wet. 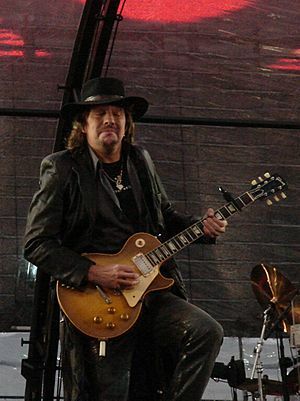 Richie Sambora, however, convinced him that the song was good. They rewrote the entire musical piece together, added a guitar solo, different drum fills and a talk box to make it a hit song. Jon gave everything he had to sing "Livin' On A Prayer" during the first part of the Slippery When Wet tour, and he completely destroyed his voice. He was barely able to sing at the end of the tour and he had to use a lot of backing tracks to fill out the parts that he could not sing anymore. He was also using the services of a vocal coach to help him finish the tour without losing his voice completely. At the end of the tour, they had played 206 shows all around the world. The band members took a break before going back into the studio to make another record. After the enormous success with "Slippery When Wet" and the following tour, Bon Jovi released their fourth album "New Jersey" in 1988. It was also successful and contained the hit "Bad Medicine" and the ballad "I'll Be There for You". Between 1990 and 1992, the band members went their separate ways for a while. Jon Bon Jovi released his first solo album "Blaze of Glory", that served as the soundtrack for the movie "Young Guns II". In 1992, "Keep the Faith" was released. The album signified a music genre change. Bon Jovi turned away from heavy drums and wild guitar solos, and their new sound was smoother and calmer than in the eighties. The piano had a bigger influence now and the lyrics had a more serious meaning. The song "Keep the Faith" is about social and religious problems. The singles "Bed of Roses", "Keep the Faith" and "In These Arms" reached the Top 40 in the United States. In 1994, Bon Jovi's first best-of-album was released: "Cross Road". It includes the hits from 1983 till 1992 and two new songs. 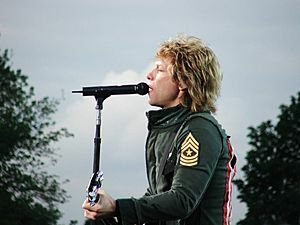 One of them, "Always", became one of the most successful songs of Bon Jovi. "Always" is a love song and a power ballad completely written by Jon Bon Jovi. The 1995 album "These Days" was the band's sixth studio album. The sound is calm and the lyric content is very serious. "This Ain't a Love Song" was the lead single of "These Days" who sold over 11 million copies all around the world. From 1995 till 2000, Bon Jovi had a longer break. The band members focused on solo projects and family. In 2000 the first album after 5 years was released: "Crush". The album itself was not as prosperous than "Slippery When Wet" and "Keep The Faith". But the hit-single "It's my Life" became the most successful song of Bon Jovi. It reached the first place in the charts of many countries. The next disc was "Bounce" in 2002. It's affected by the September 11, 2001 attacks. "Bounce" was not very successful. "The Circle" was released in 2009. They were on tour in 2010 in places like New Jersey. It consists of songs like "We Weren't Born To Follow", "Thorn In My Side", and "Bullet". Their newest album "What About Now" was released in 2013. 1986 - "Slippery When Wet"
1992 - "Keep The Faith"
2001 - "One Wild Night Live 1985-2001"
2003 - "This Left Feels Right"
2005 - "Have a Nice Day"
2013 - "What About Now"
Bon Jovi Facts for Kids. Kiddle Encyclopedia.